The Ports to Plains Alliance is a proposed four-lane divided highway system that promotes trade and transportation nationally and internationally throughout the Great Plains Region. The Ports to Plains Alliance begins in Laredo, TX and runs through nine states of the Great Plains region into Canada via the Port of Raymond in Montana. The Ports to Plains Alliance is federally designated as a High Priority corridor, this designation qualifies Ports to Plains Alliance for special Federal funding above and beyond each states standard allotment of Federal Highway funds. 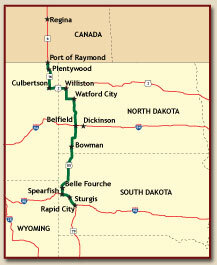 The TRE begins in Rapid City and flows through the cities of Spearfish, Belle Fourche, Bowman, Belfield, Watford City, Williston, Culbertson, Plentywood, and finally through the Port of Raymond into Canada. TR Expressway is a major transportation corridor and primary delivery artery serving the Williston Basin. We welcome the participation and partnership of the Williston Basin Energy Industry to create these improvements and opportunities. 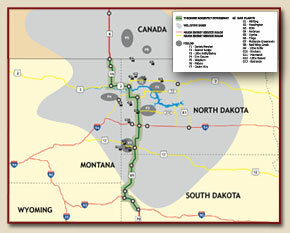 TRE is the central corridor for over 400,000 barrels of daily production in the Williston Basin. TRE provides a transportation corridor for oil rigs, pipe, steel, and supplies from Edmonton, Calgary, and Regina to the north and Houston, Dallas, and Denver from the south. TRE transports tens of thousands of barrels of daily production to tank farms for pipeline transport. TRE is a collector corridor for six major east-west highway systems that service major oil development areas. TRE provides a safe and efficient highway for over 300 oil service companies and crew transport throughout the Williston Basin. The vision of the Theodore Roosevelt Expressway Association (TREA) is to initially promote the updating of the corridor's current, standard two-lane, formatting into a super two highway format. A super two highway format would improve on the current highway format by widening the shoulders, adding passing lanes on hills, and placing turning lanes at intersections to help improve overall travel efficiency and safety. 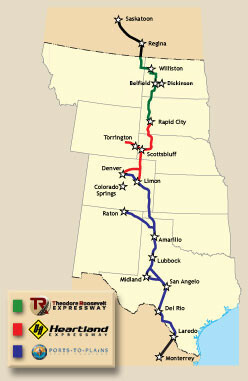 Eventually once super two construction has been completed the TREA would promote the development of a complete four-lane infrastructure to help ensure complete system continuity with the rest of the Ports to Plains Alliance and provide capabilities to handle increased traffic demands that will be generated from the Southern sections of the Ports to Plains Alliance. The TRE will stimulate transportation opportunities in a 100+ mile area on either side of the highway by improving trade efficiency, adding economic growth opportunities, and improving overall highway safety. The opportunities that this corridor will provide are invaluable to the future of this region. Along with corridor development the TREA will be pursuing marketing initiatives and trade opportunities both nationally and internationally to assist in strengthening the regions overall economy and bringing recognition to the area. The TREA is committed to benefiting the region by working with partner organizations, local political subdivisions, state and federal agencies, and private sector businesses. The Theodore Roosevelt Expressway is counting on your membership, because you are the key to success. To find out more about the Theodore Roosevelt Expressway, including memberships and other opportunities, contact us at 701-577-8110.